Oops. 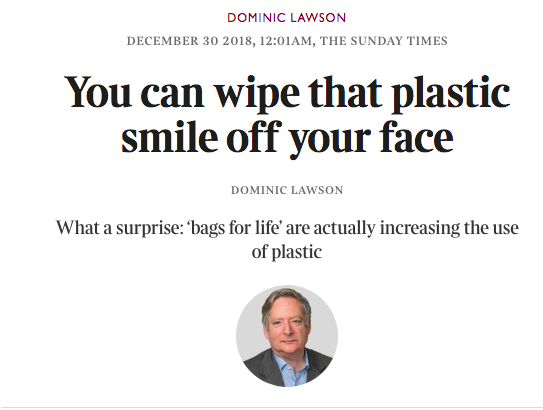 Just when the government was congratulating itself on victory in its “war on plastic”, it turns out that we — I mean the British people — have not been such willing soldiers after all. Earlier this year the environment secretary, Michael Gove, acclaimed the news that in 2017-18 the biggest seven UK retailers had reduced their sales of “single use” plastic bags from 1.3bn to 1bn. Britain, he declared, had become “a global leader in protecting our seas from plastic”. Only it now turns out that more than a billion “bags for life” are also being sold annually by British supermarkets. And these, which typically cost twice the 5p that the government now makes the bigger retailers charge for “single use” bags previously given away, contain more than twice as much plastic. As I say: oops. According to figures unearthed from the big retailers by the international campaign group the Environmental Investigation Agency, Tesco alone issued 430m “bags for life” in the 12 months to June; overall it seems that the average household bought 44 “bags for life” last year. That is not surprising: which of us actually carries one of the things around with us wherever we go? Anyway, the person most associated with this misfiring policy is none other than Sir David Attenborough, whose Blue Planet II television series highlighted the effect of plastic pollution on marine life. Actually, Sir David is as ardent a warrior against anthropogenic climate change as he is against single-use plastic. Which is where a problem arises. The two causes are in conflict. I have in front of me a 120-page document issued by the UK’s Environment Agency in 2011, pithily entitled “Lifecycle assessment of supermarket carrier bags”. Starting off with the helpful explanation that “the main function of a carrier bag is to carry groceries and goods from the shop to the home”, the report rigorously analyses the environmental impacts of various forms of bag, from the then free lightweight disposable plastic bag to the heavier plastic bag (not then called “bag for life”) and those of entirely different composition, such as paper and cotton bags. Taking into account the land, water and energy — hence carbon emissions — required in their manufacture, the Environment Agency concluded that a paper bag would have to be used three times before it could be regarded as more environmentally correct than a lightweight plastic bag used only once. In fact those plastic bags are typically reused — roughly 40% of them when they were free — as pedal bin liners. 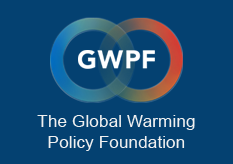 On that basis, said the report, a cotton bag would have to be used 173 times before its “global warming potential” dropped below that of each of those flimsy plastic bags. In effect, by ignoring the analysis of its own Environment Agency, the government took the side of the viewers distressed by Attenborough’s programme, against those who take seriously the same man’s declaration, most recently at this month’s UN climate change conference in Katowice, Poland, that manmade global warming is the biggest threat to life as we know it. In so doing, the current British government is definitely in tune with public opinion (and mine). Most people are more concerned with the here and now than what may or may not happen in a hundred or a thousand years’ time. And, by the way, they also want their government to take its own citizens’ wellbeing more seriously than what might happen “to the planet” at some unspecified point in the future.